Dean Downing took the inaugural Dumfries Bike Fest Grand Prix yesterday with a late burst, his first Premier Calendar win since winning the Bikeline Two-Day in 2008. Downing won the race alone after attacking his breakaway companions in the closing stages of the race, escaping from a group that included Yanto Barker, Matt Stephens and Downing’s team-mate, Graham Briggs. It was the perfect redemption for the Rapha rider after an error in Friday’s Elite Circuit Race Series in Dumfries proved costly. Downing approached the final corner too quickly and caught his front wheel in the barrier, handing the win to Endura’s Ian Wilkinson. “Friday’s result really helped me mentally,” Downing explained. “The team rode so well on Friday and I had a perfect lead-out from Darren Lapthorne but I clipped the barrier with my front wheel on the last corner. If you give ‘Wilko’ half a chance, he’ll take it so fair play to him”. The strong headwind in the latter stages of the Dumfries Bike Fest Grand Prix played into Downing’s hands; he attacked and found the teams behind unwilling to commit to the chase effort. “There was a block headwind in the last 10km and a lot of attacks but nothing was really sticking. I attacked from the front, got a gap, looked back and saw the riders behind had sat up so I just put my head down and went for it”. It may have been Downing’s first Premier Calendar win in two years, but June’s focus will be squarely on the Tour Series, with his Rapha team commanding a one-point advantage over Motorpoint Marshalls Pasta. “That’s the main objective,” he says, “and we got off to the perfect start in Canary Wharf and Durham”. Andrew Fenn was the top British finisher in the prestigious Paris-Roubaix Espoirs race at the weekend, won by young American prodigy, Taylor Phinney. The Olympic Acadmey rider, Fenn, already has a history with the event, winning the Junior Paris Roubaix in 2008. Fenn finished the race in 11th, with Phinney leading out – and subsequently winning – the sprint in the iconic Roubaix velodrome. Geraint Thomas had a consistent showing in Germany to finish 11th overall in the Bayern-Rundfahrt stage race. The British Sky rider had two top-ten results and 15th in the 27km TT to claim 11th, with Belgian Maxime Monfort scooping the overall. Thomas’ next competitive showing will the Dauphiné Libéré, which starts on June 6. 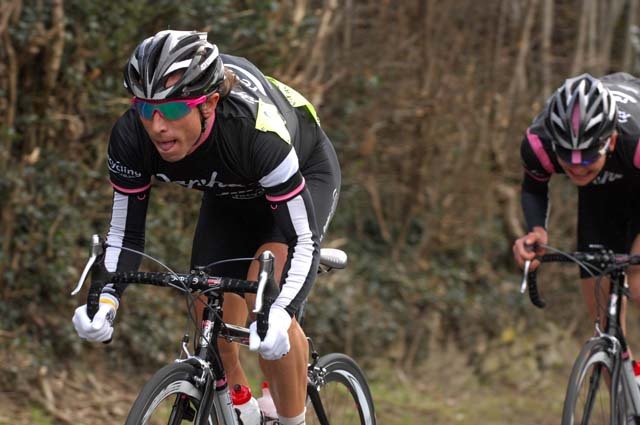 Sportivistes are offered the opportunity to take part in the Ride to the Horns sportive this year with an added incentive: Formula One ace and cycling fanatic Mark Webber will also be taking part. “I use the bike in training not only for fitness but because it gives me the chance to get away from all the other day-to-day business,” said Webber. The Ride to the Horns is a 97-mile ride through the undulating Chilterns. The ride takes in some of the roads made famous by the Tour of Britain and Archer Grand Prix as well as Brill before returning to the classic Chiltern climbs of Whiteleaf, the Crong, Dunsmore and the Hale. Entries are restricted to 400. Welsh Cycling will be running two Youth track cycling events (or ‘Summer Sizzlers’) in the build-up to the National Youth and Junior Track Championships due to take place in the last week of August in Newport. The events will be aimed to give riders a taster of what to expect ahead of the Nationals with a focus on being a relaxed and enjoyable event. There will be spot prizes awarded at the end of each event throughout the categories and BC points will be awarded for each event. An ideal opportunity for riders to gain some valuable track time ahead of the National Championships.